Posted June 1st, 2013 by cconnections & filed under Arts & Culture, projects, Projects & Programs. 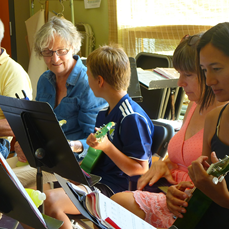 The program provided a week of workshops for adults and children in music, art, dance, and performance, giving community members opportunities for learning and sharing that they may not otherwise be able to access. Qualified instructors were hired from the Basin area, which also provided qualified local artists and musicians an opportunity to expand their experience and exposure. The program also added to the economic viability of the area promoting the camp as part of a family vacation package. There were 50 participants, 22 adults and 28 children, and visitors came from Nelson, Castlegar, California, Medicine Hat AB, Canmore AB, Langdon AB, and Vancouver. Approximately 50% of attendees were from the East Shore.